Copyright © 2003 John H. Betts - This image is copyrighted. Unauthorized reproduction prohibited. 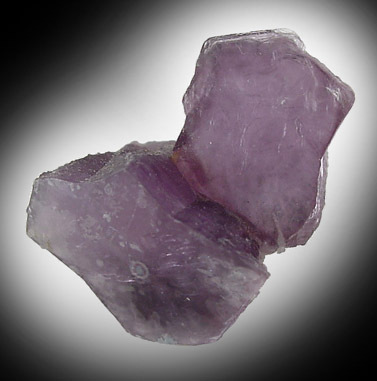 Two interconnected crystals of lepidolite. The crystals are lilac-purple and transparent. The crystal shape is unusual - starting to form the classic star-mica shape, but not quite there yet. No damage. Overall size of mineral specimen: 30x22x14 mm. Size of individual crystals: 16-20 mm.